Congratulations to tour winner Cassandra D. and to host winner Kit'n'Kabookle. 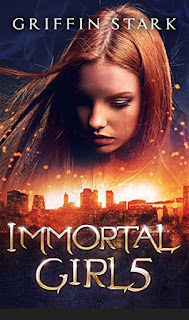 Goddess Fish Promotions is organizing a Virtual Name Before the Masses REVIEW ONLY Tour for IMMORTAL GIRL5 by Griffin Stark, a 165 page YA Fantasy available January 22 from Real Books 360. The tour will run every Thursday for 4 weeks starting on March 21. The book is available in PDF format. Griffin Stark will be awarding 1 copy of Immortal Girl5, US only to a randomly drawn winner via rafflecopter during the tour. Because this is a review tour, Goddess Fish Promotions will award a $5 Amazon GC to a randomly drawn host. April 4: Archaeolibrarian - I Dig Good Books!